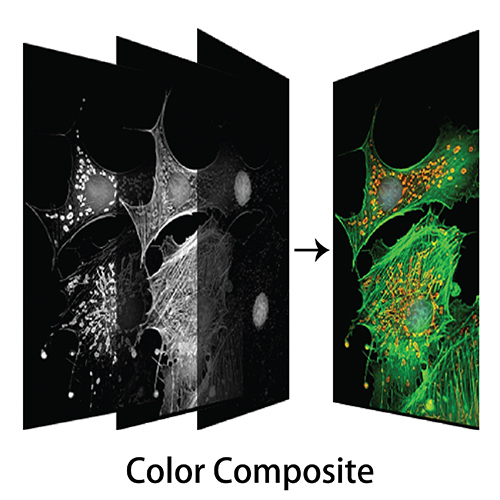 Combining multiple fluorescent images into a composite is a common practice. Usually, fluorescent wavelengths are acquired individually and then merged together. And often times it is necessary to acquire and merge a fluorescent image and an image acquired through brightfield techniques. For a variety of reasons it is not always possible to acquire the images simultaneously, so image processing tools are necessary to present a complete and accurate qualitative picture. Several issues need to be considered when combining fluorescent images. Since images of this type are typically acquired in a monochrome environment, it is necessary to have tools to colorize the individual images. Registration issues need to be considered as well, as chromatic shift and other effects may be revealed in the composite image. Finally, three dimensional fluorescence stacks may need to be merged together into a composite image to view the interactions of the various fluorochromes with one another. The Color Composite tool is used primarily to merge and register multiple fluorescent images acquired as monochrome single wavelengths into a color composite image. It is also an excellent tool for merging brightfield/fluorescence combinations such as those created using Green Fluorescent Protein (GFP) and Differential Interference Contrast (DIC) images.